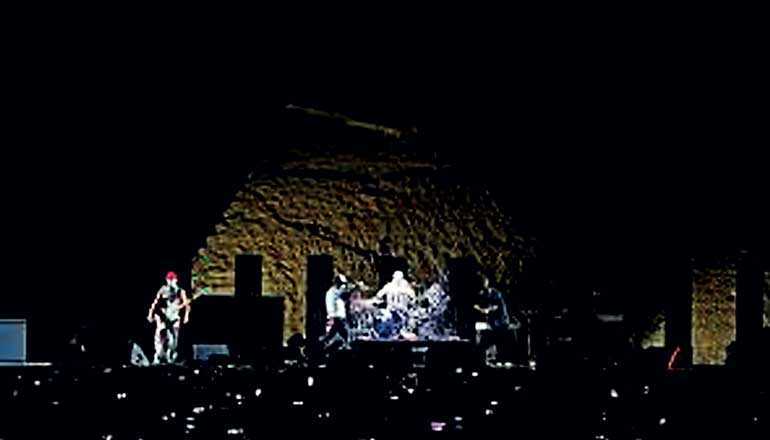 CAIRO (Reuters): Californian group Red Hot Chili Peppers played in front of Egypt’s great pyramids of Giza recently, entertaining more than 10,000 people at the site and many more over a live-stream link. With the three ancient monuments silhouetted behind the stage, the funk-rock band opened with ‘Can’t Stop’ from the 2002 album ‘By The Way’ and followed with ‘Californication’, ‘Dark Necessities’ and other hits. Fans travelled from 67 countries, said concert organiser and Travco Group Vice Chairman Karim El Chiaty. The band is currently on a world tour and working to complete their 12th album following their 2016 release ‘The Getaway’.